Our intrepid heroines have found their way home, so what happens next? Maryellen couldn't believe her luck. She'd had all sorts of adventures, just like one of the film serials or comics she devoured at home. They'd fought robots and aliens and met a strange man with a time machine that was bigger on the inside, which made it better than anything she'd ever read, because it had happened to her. And best of all she'd made two new friends. No. Best was when Beckie had pretended to faint, just like a real movie actress, while Maryellen and Kit had knocked out the Master with Kit's baseball bat. The Doctor had brought them back to their own times, as he had promised, though not without a few detours and fantastic adventures along the way. 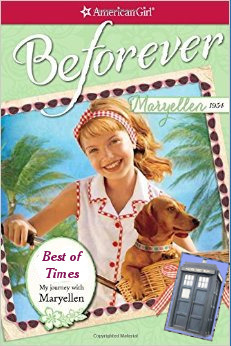 Rebecca, then Kit, and finally Maryellen had found their way back home and since it was a time machine, no one even noticed that she'd been gone. It didn't matter that they were all from different times. They'd made a pact to meet again in Maryellen's time, even though both Kit and Beckie would be all grown up. She hoped they remembered her. No one else would believe the things she'd seen. She could write stories about their adventures, but that wasn't enough. She wanted to talk to people who remembered them. Maryellen hesitated at the entrance to the park. They'd chosen this place over a more public place because they didn't want people asking unanswerable questions, such as how the three of them had met. It felt even more important now, after she'd spotted Beckie's picture in one of her movie magazines and knew that Beckie had grown up to be Rebecca Rose, famous actress, just like she'd said she would. She hadn't expected to learn anything about Kit, but then she'd found a career story by K. Kittredge in her school library. and the back flap had a picture of Kit, not looking much different than she had when they'd traveled together on the TARDIS. Further research in one of the library's reference books revealed that Kit had played baseball during World War II before joining the newspaper. They'd changed, and she would still be a kid. Would they even have anything to talk about? An actress and a newspaper reporter and her. They were probably too busy with their careers to come to Florida anyway. She'd almost convinced herself not to bother when she spotted Kit and Beckie, sitting at the picnic table, talking away. Before she even got close, Beckie spotted her and started waving. "You came. We were worried that you wouldn't want to see us old folk," Kit teased. Maryellen leaned her bike against a tree and ran over to join them. Soon all three were talking a mile a minute about the things they'd seen and done, and Maryellen knew that they might be older but nothing had changed.